YouTube is one social media site that many businesses leave out of their social media marketing plan to their own peril because they don’t know how to properly utilize videos to help market their business. Or, they will create some overly hypey videos that are little more than an infomercial which does nothing but irritate YouTube users. YouTube users are looking for information, entertainment and value, not advertising. When your business hits on the right combination of how to create an entertaining or informative video while discreetly mentioning the products or services it sells, it can be viewed by millions. Create a YouTube account for your business and set up the profile with all the pertinent information and branding details, then start to look around. Not only do you want to post your own videos that will further your business marketing efforts, but sharing other videos that your target market will appreciate will go a long way in creating a YouTube channel that will get a lot of attention, without spending any money out of your marketing budget. While you are creating this mix of favorite YouTube videos and creating and uploading your own business videos, you can make sure you have a mix of topics that will complement your products and services that your target market will appreciate. After you create a YouTube channel for your business, keep posting and stay active even if you only upload your own business videos on a monthly basis. This will help build relationships with other YouTube users so your channel will still receive attention. You can also continue to favorite and add other interesting new YouTube videos from other users to your channel to keep you followers engaged. Along with quantity, pay attention to quality. While you do not have to hire a professional filming crew to create high quality videos, you want to make sure the ones you create on your own look professional to fit into your business culture. Investing in a quality camera for your business to create videos, or hiring a freelancer to help create quality videos from slides and presentations will help. For every video that you upload to YouTube, make sure and talk about it. 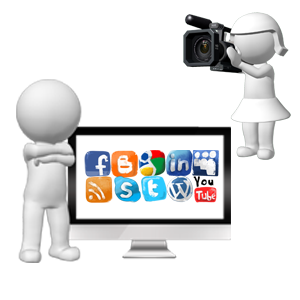 Embed your own business YouTube videos on your business website and create links to them from you other social media sites. This will give some exposure for all your efforts. One thing you will notice is that because YouTube is owned by Google, you will start to get some serious search engine improvements with your YouTube activity.